I am so excited to share one of my FAVORITE books!!!! 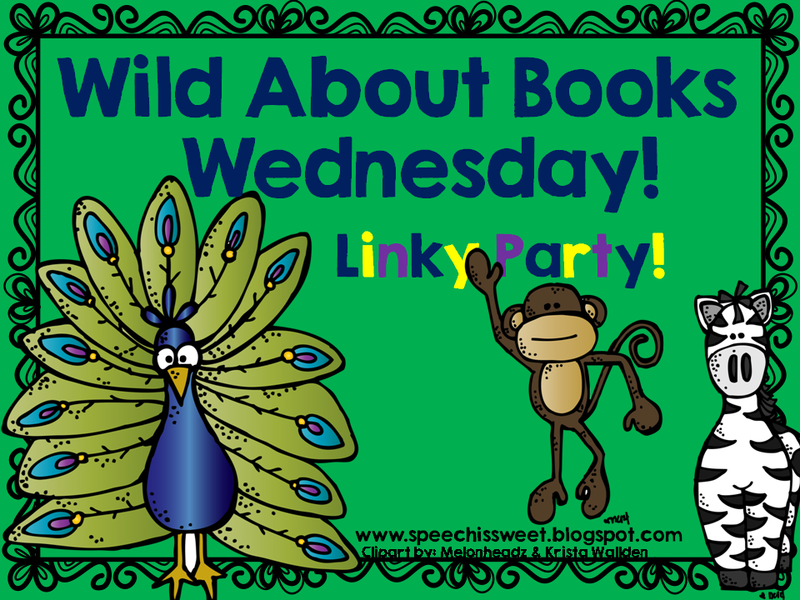 Since today is Wednesday, I am linking up with Scarlett over at Speech is Sweet for “Wild About Books Wednesday” and I’m linking up (a day late...as usual) with Mrs. Jump’s Class for “Book Talk Tuesday”! Since Halloween is in a few days...I’m moving on to planning for Thanksgiving! 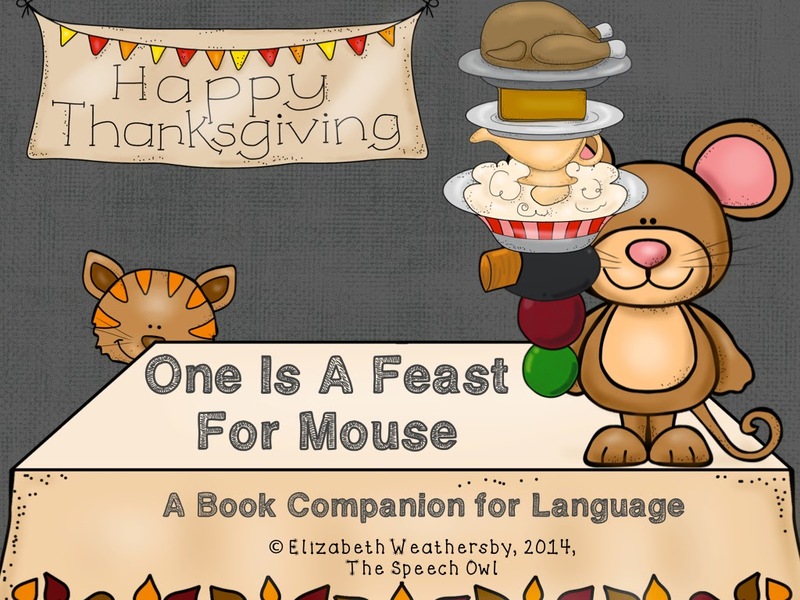 “One is a Feast For Mouse: A Thanksgiving Tale” by Judy Cox is one of my all time favorite Thanksgiving books! In this absolutely adorable book our sweet mouse friend sneaks out of his hidey-hole to find some yummy food. As Mouse scampers over to the table he sees a luscious green pea. He decides a pea will be enough for him and starts to head back home. As Mouse is walking across the table he starts to notice more and more food scraps. 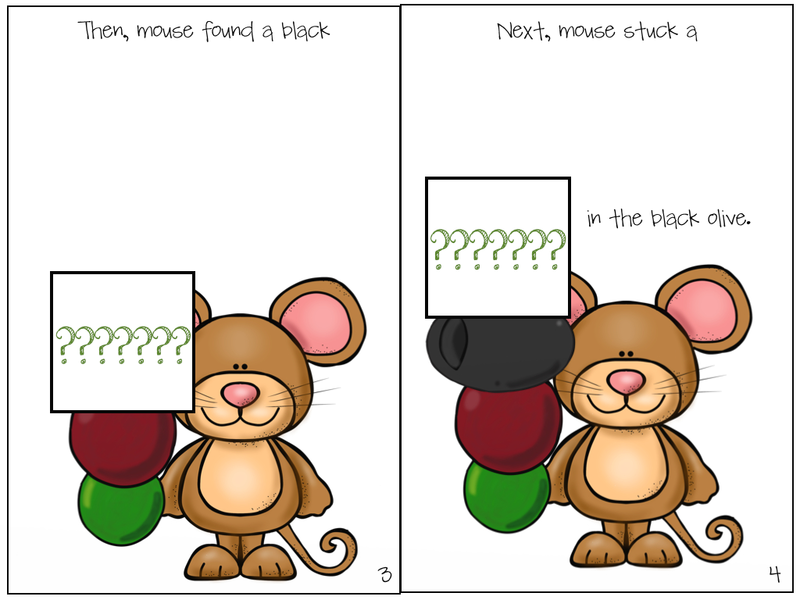 Mouse gets greedy and all kinds of craziness ensues! Go grab the book to see what happens next! 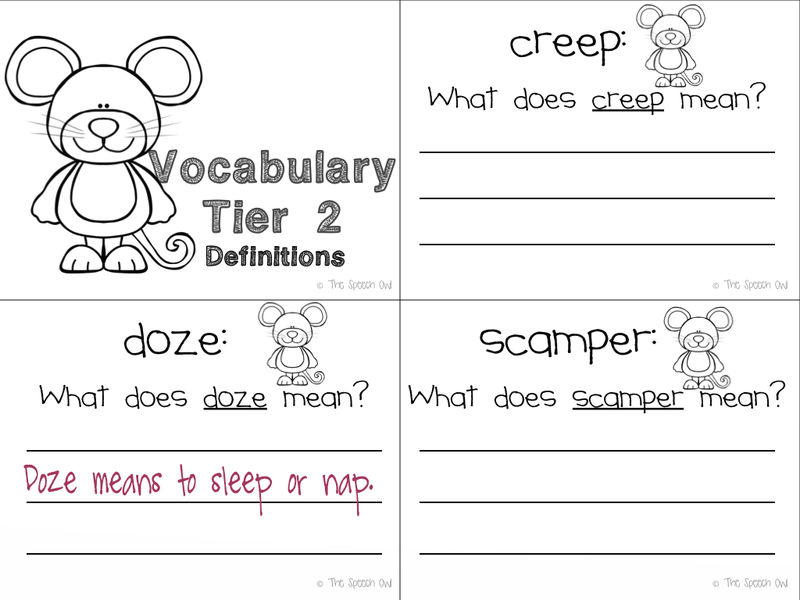 ***Vocabulary- There are so many Tier 1 and Tier 2 vocabulary words in here!!! 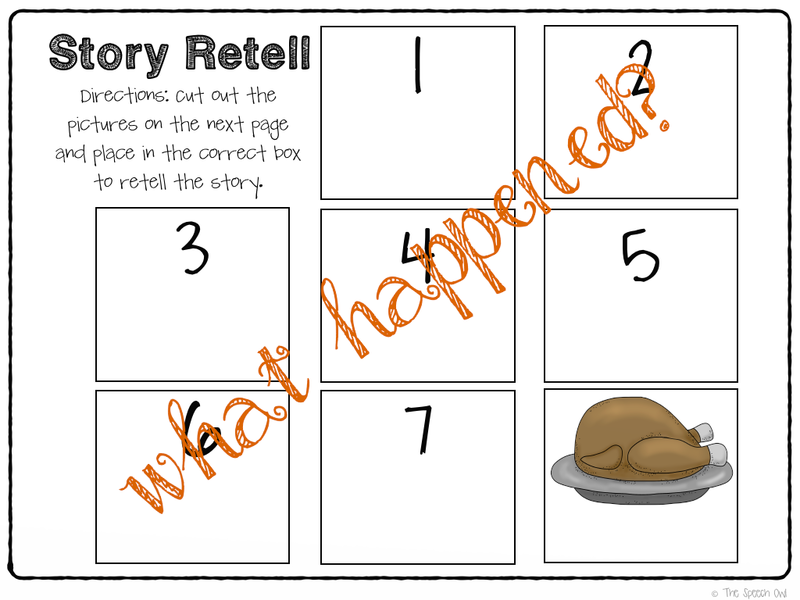 ***Sequencing- We are going to use the retelling map and booklet to sequence and retell the story. A few years ago, I made large drawings of Mouse and all of the food, so we are also going to use the felt board while we read! I’ll post pictures later on facebook (click here) and instagram (@thespeechowl). 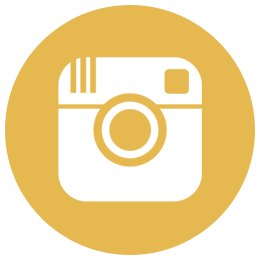 Make sure you are following me on both! 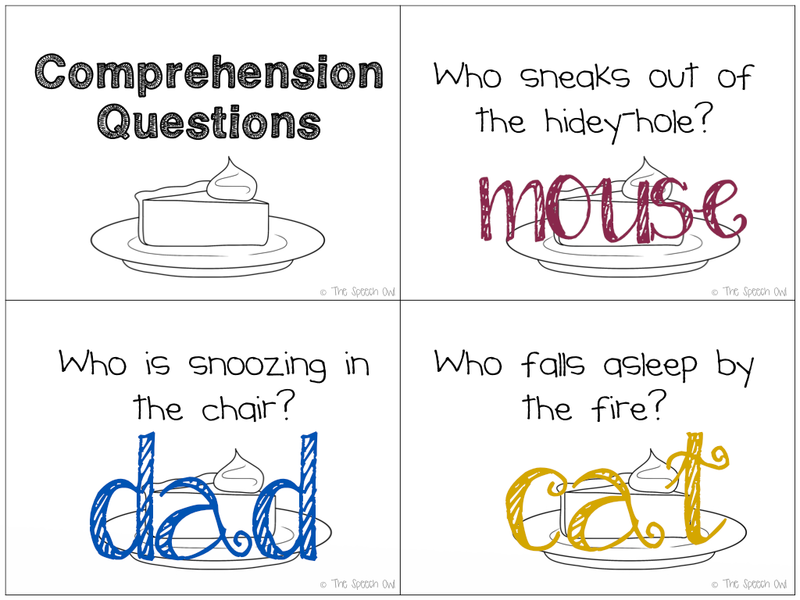 ***Comprehension Questions- Some of my kiddos are going to expressively answer the comprehension questions and some of my kiddos will have answers presented visually in a field of 3. 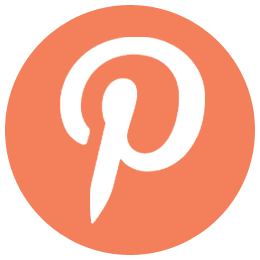 ***Categories- We are going to work on several different category sorts!!! 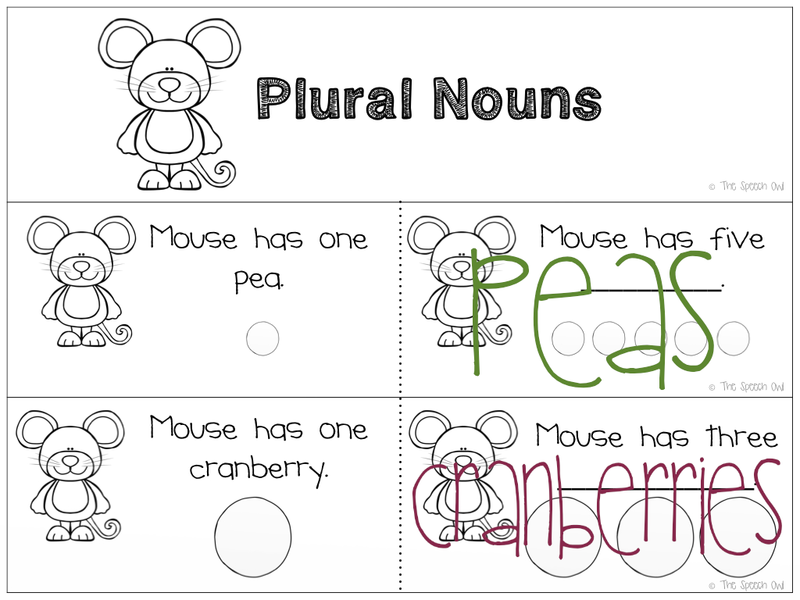 ***Plural Nouns- We are going to work on plural nouns using the Tier 1 vocabulary from the book! 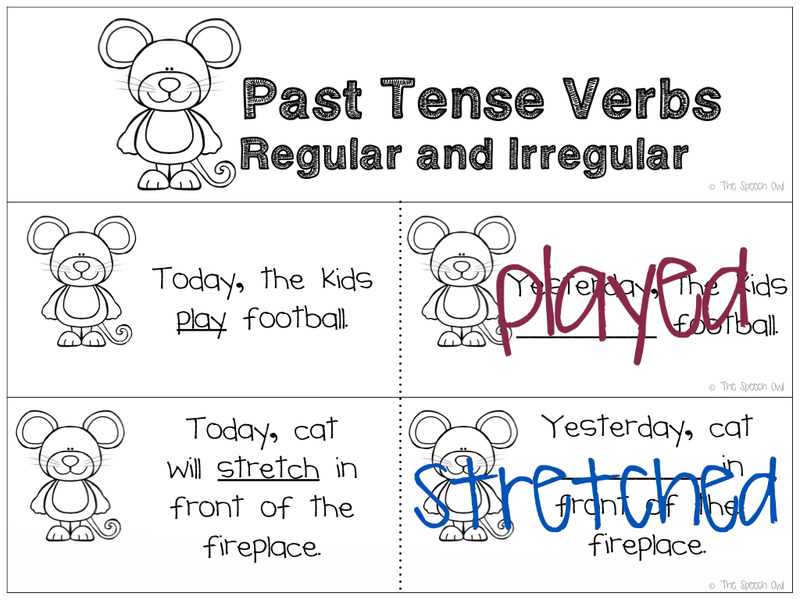 ***Past Tense Verbs- We are going to work on past tense verbs based on the events in the story! 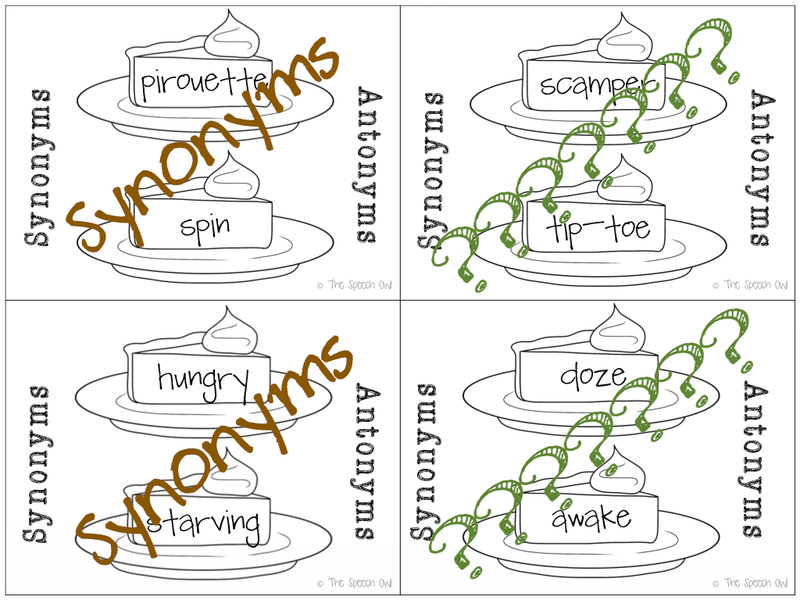 ***Synonyms and Antonyms- We are going to determine if word pairs are synonyms or antonyms. 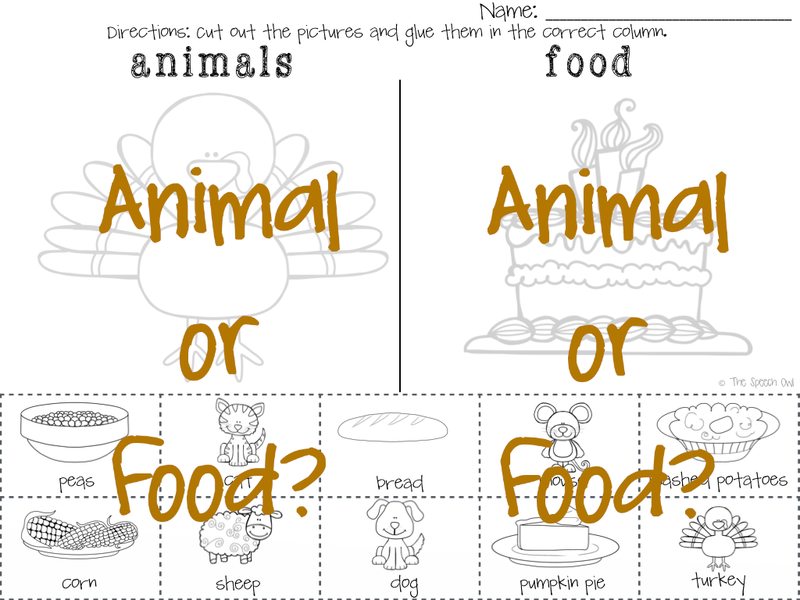 We are also going to produce synonyms and antonyms and do a worksheet for each! 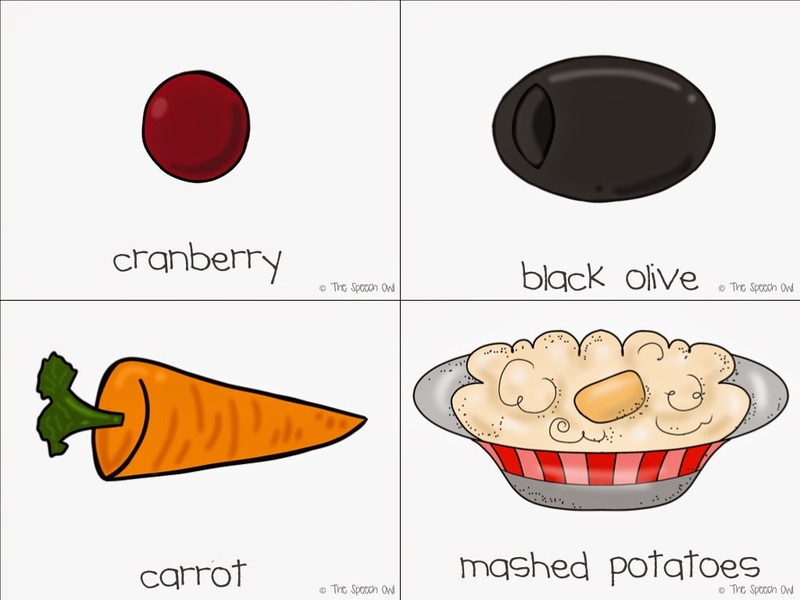 We can also discuss what we want to have at our Thanksgiving feasts (there is a page with visuals for this). We can talk about greed. 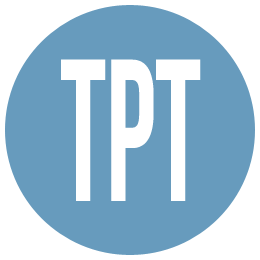 We can talk about what we are thankful for. How will you use this book in your therapy sessions?! 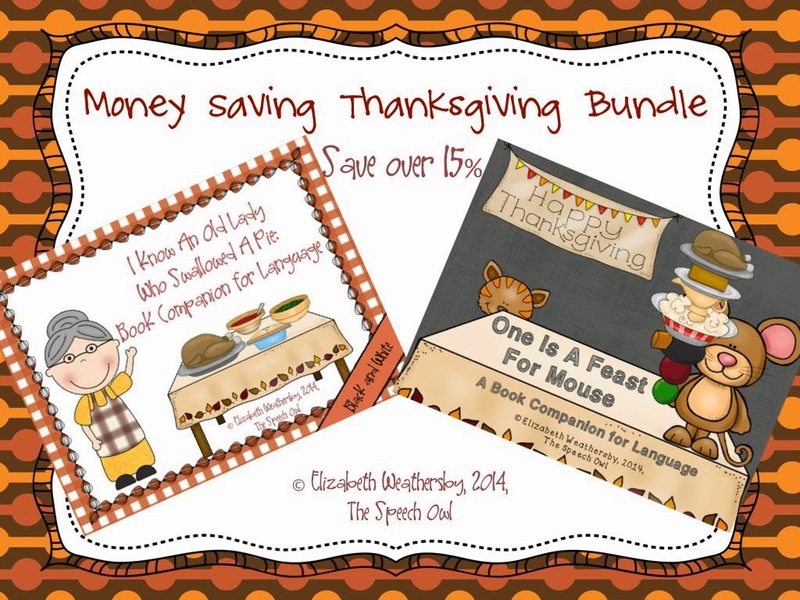 Click to Check out this money saving bundle...One is A Feast For Mouse: A Book Companion for Language" and "I Know An Old Lady Who Swallowed A Pie: A Book Companion for Language". Looks like this book can target a whole lot of different goals! This looks so useful! AND the graphics are amazing! SO SO SO cute!